Based in Albuquerque, New Mexico, the lawyers at the law firm of Martinez, Hart, Thompson & Sanchez, P.C., provide the dedicated and compassionate counsel to victims of personal injury or wrongful death. Our law firm believes strongly in fighting for the rights of those who have suffered serious injury or death as a result of negligent or criminal actions of others. Utilizing our decades of experience, we give our clients the personal attention they deserve. This begins by sitting down with you and hearing your story. We want to learn more about you and your family and what you want so that we can provide you with the best representation possible. We handle all types of injury cases - from injuries to children, child abuse and neglect to wrongful death, car crashes, trucking accidents and more. We represent ordinary New Mexicans to help them hold corporations, insurance companies, school districts, and governments accountable for the bad choices that inflicted injury. We aren’t afraid to take on the hard cases, including those that will only prevail if we try to change the law. Our goal is to make our community safer. 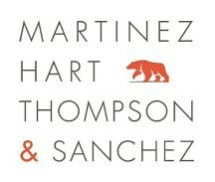 Martinez, Hart, Thompson & Sanchez, P.C., is a five-attorney law firm that has been serving the personal injury law needs of clients throughout New Mexico for 25 years. We are here to help you restore a sense of balance in your life and hold people, corporations and governments accountable for their wrongdoing.